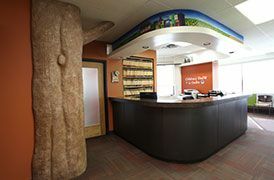 At Children’s Dental Centre in Winnipeg, our kid-friendly office is designed and well-equipped to put children at ease. With video games, TVs and a toy train that travels around the office, we’re sure your baby, toddler or adolescent will feel comfortable in our surroundings. We are a single-doctor practice, which ensures continuity of care. We are very busy giving personalized attention to every client who visits us. We treat children from babies up to 18 years of age. Learn more about our pediatric dentist, Dr. Meier.